You can make some small changes to your bathroom to improve its look if you don’t have the budget to remodel it completely. Bathroom is one of the easiest rooms in the house for which you can pick up some new furniture items. 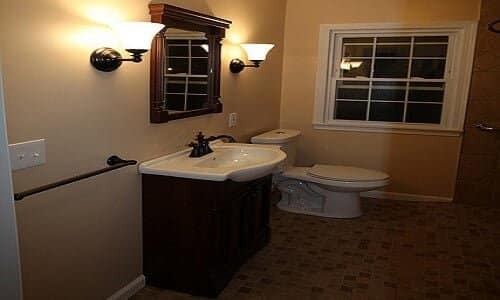 Here are some ideas on how to make over a bathroom. There is no need to throw away the old wooden boxes. If you have some wooden boxes with you, you can simply paint them and keep them in your bathroom. These boxes can hole extra toilet papers and towels. Bathroom vanity sets don’t only make your bathroom more practical but they also give it a more luxurious look. So, you must check out some affordable bathroom vanity sets online and pick one for your bathroom. You can go for the 3-piece vanity set of Dorel Kylie Collection. This is a compact and cute vanity set made from solid hardwood. This set comes in a clean and beautiful white finish that fits in any type of bathroom décor. This is one of the most durable bathroom vanity sets comprising of a revolving oval mirror, a matching stool and a large drawer. You can pick the Antique Treasures vanity set from Hayneedle if you want a more special set. Featuring a rich cherry brown finish, this set has six specious drawers with antiqued copper and glass-like handles. Two top drawers are felt lined. You can store your jewelry items in these drawers. You can check out some bathroom vanity sets having sectional drawers. A lot of bathrooms have ugly sink bottoms. You can pick a shimmery or a simple bed sheet to make a sink skirt. You can also use a bright but elegant shower curtains to cover this area. You can cover the bottom of your skin by sticking this bed sheet around your sink. Use double tape to stick it on the sink.